Since the leaves have turned and the temperatures are dipping into the 30's at night, that is my signal for comfort food. That means, bread making will be back in full swing, and pastas and soups will be on the weekly menu. I am so excited! I am a definite carb lover that embraces comfort food to the max during the cold months. Since it's officially comfort food weather, I thought this dish would be the perfect recipe to share first. I'm slightly obsessed with it actually. I loved it so much when I first made it, (pre-comfort food season. Gasp!) I have just had to put on the menu many times since. It's super easy, but so freaking amazing. And, it only uses one pan to make the entire dish! 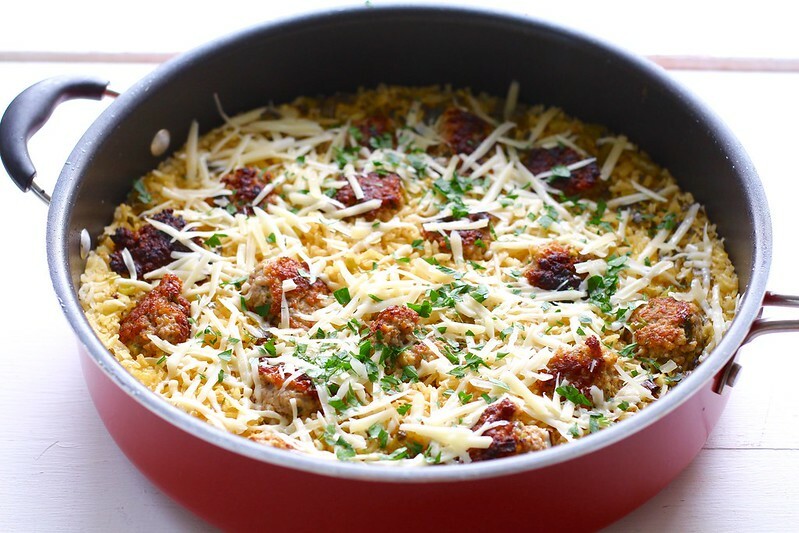 The meatballs are mixed with the perfect combination of panko, fresh herbs, and lemon zest. The original recipe calls for ground turkey, instead, I used ground pork. We always have tons of ground pork in our freezer from the bulk meat we get from a local organic farm, so I am always looking for ways to use it up. This was the perfect dish for it! So, feel free to use ground pork or ground turkey, whatever you like best! This needs to be on your dinners-to-do, as soon as possible! In a large bowl, mix together the ground pork, panko, 2 tablespoons scallion greens, egg, 2 tablespoons parsley, 1 1/2 teaspoons lemon zest, 1/2 teaspoon salt, and 1/2 teaspoon ground pepper. Mix with your hands, until completely combined. Divide into about 20 balls, about a heaping tablespoon each (I used a small cookie scoop). Place on a plate, cover with plastic wrap and refrigerate for 15 minutes or overnight. Heat oil in a large skillet over medium-high heat until shimmering. Place the meatballs in one layer in the skillet. Cook, until nicely browned on all sides. Transfer to a paper towel-lined plate, leaving the fat in the skillet. Stir in the rice in the skillet, over medium heat. Cook, stirring frequently, until the edges of the rice turn translucent, about 1 minute. Stir in the scallion whites, minced garlic, and 1/2 teaspoon salt. Cook until fragrant, about 1 minute. Stir in the broth, lemon juice, and remaining 1 1/2 teaspoons lemon zest, and bring to a boil. 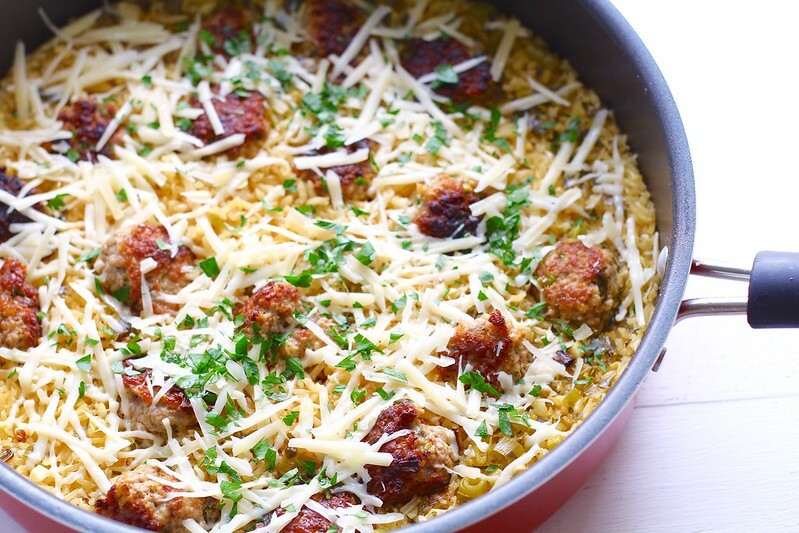 Once boiling, nestle the meatballs in the rice, cover and reduce heat to low. Cook until the rice is tender and the meatballs are cooked through, about 20 minutes. Remove from heat and let sit, covered for 5 minutes. Sprinkle with Parmesan cheese, remaining scallion greens and parsley. Serve.